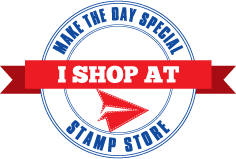 Today we have something a little different for you. The design team have all got together to organise a surprise blog hop for Tara and Rick. We all wanted to say "Ta Tara" for all the work you do and for the fantastic service you provide. And to Rick for supporting Tara and the shop. As I'm a bit useless at all of this i will let the rest of the team and their wonderful cards do the talking. You will find the full hop list below and we hope you will join us In saying Thankyou. I started by die cutting my two panels. The scalloped one i coloured using distress inks to match the colours of the melons and then heat embossed in white the pattern from Sharp backdrops stamp set. 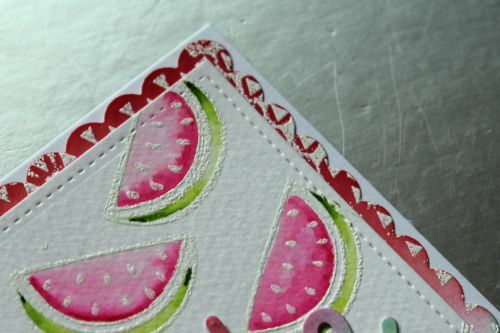 The stitched rectangle panel was cut from water colour card and the melons randomly stamped and heat embossed in white before colouring with water colour pens. I definitely want to add my name to the list. I get faster service from Tara than I do from anyone I buy from in France where I live. I ordered some new goodies late last Thursday and got them yesterday (Tuesday). I always know I won't have to wait long when I buy from Tara. Thank you, thank you, thank you. You go girl!!!!! Fantastic start to our hop, Kate! And of course, also from me as a customer and DT member: Thank you Tara for all the amazing work you do. You rock! Well I never! Not sure what to say but thanks for the thoughts. I have such great customers and the BEST Design Team in the world! Pretty coloring in watermelons, love it! What a great idea of a Blog Hop!Lovely card!Congrats and many thanks to Tara & Rick for everything! I'm, as well as others here in the States, are so glad that Tara is keeping all you witty, talented folks over the pond supplied with craft supplies. Otherwise, we wouldn't be able to see your amazing and informative blog posts. That would certainly limit my options (of course, it's all about me). So thank you Tara for providing these crafty folks with all they need to create fabulous work. I appreciate it.